US 12 begins in Detroit and heads west across southern Michigan. It reaches Lake Michigan in the southwest corner of Michigan, and crosses into Indiana, where it follows the lakeshore across northeastern Indiana to Illinois. US 12 stays to the south and then west of Chicago before heading northwest out of the Chicago area toward Wisconsin. The route continues heading northwest through Wisconsin, passing through Madison, and reaches the Minnesota border east of Minneapolis. 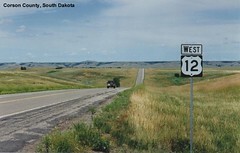 Once reaching Minnesota, US 12 begins heading west again, passing through the Twin Cities on its way to South Dakota where it begins heading north slightly, passing through the southwest corner of North Dakota before entering Montana. As US 12 crosses Montana, it passes through Helena and Missoula. The route enters Idaho at Lolo Pass and winds through the mountains of northern Idaho before arriving in Clarkston, Washington. After entering Washington, US 12 heads southwest to Walla Walla, and then slowly heads northwest again to Yakima. The route crosses the Cascades between Mount Rainier and Mount St. Helens, and then heads northwest again to arrive at the Pacific Ocean in Aberdeen, where US 12 ends at US 101. I drove US 12 from Detroit to Aberdeen in summer 1996 and took these photos along the way. View individual pictures of US 12 on Flickr. Learn about how the alignment of US 12 has changed since it was originally commissioned. Information about the ends of US 12 can be found here on the www.usends.com website.